This multi-faceted project for the University of South Carolina included three distinct interventions. The first was a 1,400 square-foot addition of a new multi-purpose meeting room on the premium seating and press level of the stadium. 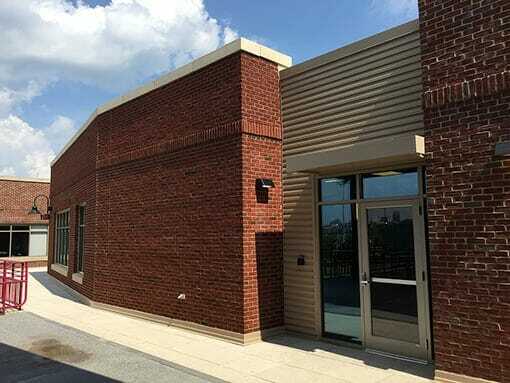 This addition is to be used as a media room for pre- and post-game press conferences, as well as a team meeting room for the Gamecock baseball program. This room provides three tiers of stadium seating facing a press table/stage with a retractable backdrop for press conferences, as well as projection screen for film study. A separate-but-connected space in the addition provides an area for members of the press to connect their devices and work on their assignments. 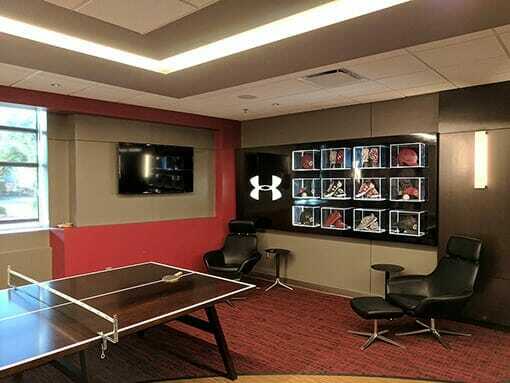 The space that was previously used as a media room has been converted into a new “player’s lounge” for the men’s baseball team. The primary focal wall of the room includes an impressive flat screen display with connections for video games, recreational movie viewing and film study. The “sports bar” corner of the room includes two additional flat-screen displays facing a bar-height counter with charging stations for portable devices and is used for study and eating meals. Additional soft-seating groups, video game stations, and a ping-pong table are included in this space. Finally, a raised terrace area was created along the first-base line to provide a “party-deck” as an additional premium seating option for patrons.